Since I am in Indonesia, I should have been blogging more things Indonesian. Obviously, I haven’t been doing that, and that’s bit retarded. I’m really sorry for my slow thinking. Although recently fortune has been on the low side for Indonesia, there are still good things that made up this so-called “my home country”. 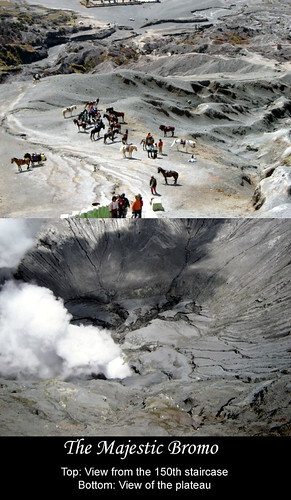 One of my favourite spots in East Java [my province] is Mount Bromo, located in the city of Probolinggo. Before we dwell into what you might find in this peaceful breezy part of East Java, let’s take a look for a second into the unfortunate [refer to picture above]. More than 80 days ago, the natural gas exploration in Porong, Sidoarjo, accidentally hit the source of hot earthen mud instead. As a result, the hot mud burst out endlessly, up to this very day, leaving countless homes and land drowned in this thick smelly concoction. Nature is angry, people are grieving. The only one to be blamed is the group of people conducting this egoistic action that will only benefit themselves. 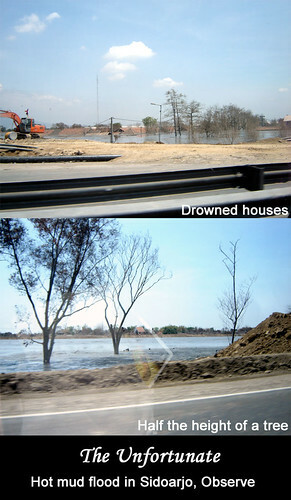 This devastating incident is only to become a lesson that man and nature must live in harmony. In other words, they must respect each other. Otherwise man’s power will always lose out from nature’s will. Thus, I urge everyone, everywhere to preserve their nature. Only then can we fully enjoy what nature provides us. Remember, what goes around, comes around. 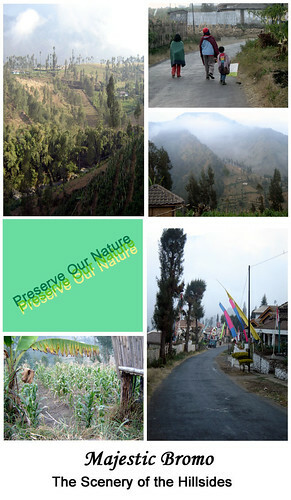 Now let’s enjoy a few snapshots that I managed to take from a view trips to Bromo. Some are pictures from a year ago, yet they are still relevant. Some were taken just yesterday. I don’t have much to say, just hope you can all enjoy and appreciate these. To get to the top of Mt. Bromo, you must rent a four-wheel-drive jeep to get you through the sand sea [literally, it is a sea of sands or dust]. Afterwards, you can rent a horse to climb the steep, stony surface just before the beginning of the stairs. Finally, you will be facing a steep 150-case stairs that will take you to the plateau of Mt. Bromo. Take these steps easily and do not rush. On the 150th case, you’ll be able to have an eagle-eye view of what’s below you. Which is a magnificent view! Beware of the steep surface and slopes. Also beware not to breath in too much of the sulfur omitted by the plateau! In preparation of this hike, you must wear a strong pair of sandals and bring a bottle of water with you. Another option that you may take is to walk through the sand sea all the way up to the plateau by foot. I have never done this, but my friend and most other tourists have. It was by accident that our family came to like this place. First, my friend, who traveled on foot all the way up to the plateau, stayed in this hotel with her group. My curiosity was sparked by its unique name. 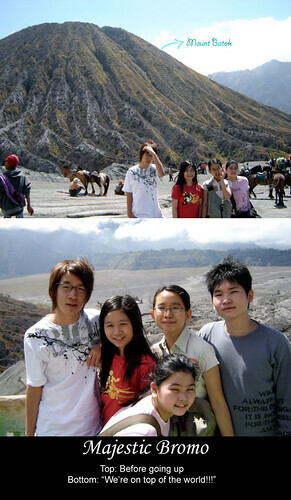 Thus, on our first visit ever to Bromo, I asked my father to drive us to this ethnic-looking place. We went on and tried the foods in their restaurant. We have been going there often since then. On that first visit, we discovered that the hotel is owned by an Indonesian-German couple and that the name was taken from their names, Yok and Uschi. Our favorite foods here are European, potato-based dish. There are a lot to choose, from roestis to potato pancake. They also serve Indonesian foods such as “soto ayam” [Indonesian chicken soup] and “nasi goreng” [fried rice]. Yesterday, I ordered their brown sugar, cinnamon and honey oatmeal porridge to fight the cold weather. Interesting that from this hotel, we adopted our lovely Bonzo. His mom is still around in the hotel, her name is Luli. The hotel has a lot of small cottages that you can choose, spread out on their spacious backyard. 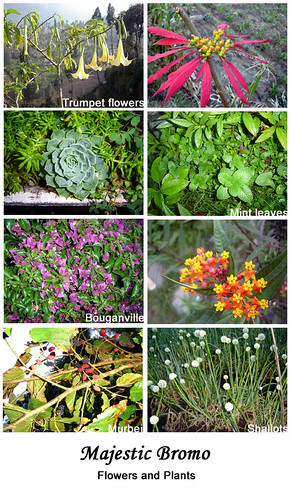 On one spot, they do gardening as well! We found mint leaves, potatoes, tomatoes, peas, murbei, cabbage, and shallots cultivated. Just some recipes I want to share with all of you from my recent cooking activity. I’m not from Korean ancestry, yet I love Korean foods. Who doesn’t? Korean foods are nicely spiced with common ingredients and mostly flaming hot with the addition of “gochujang” [Korean chili paste]. I fell in love with Korean food while in Toronto, Canada. The Korean Town in Bloor and Bathurst provides a wealth of Korean restaurants and markets. Making my eyes wide open to the selection of Korean foods. Thanks to some people I met while volunteering with ISC, I got my first chance at trying “Gam Ja Tang” [Pork Bone Soup] at Korean restaurant called Ka Chi. Ever since then, I’ve been visiting Korean town numerous of times with Mr. W.
What I find interesting about Korean restaurants is that they always provide side dishes for free. 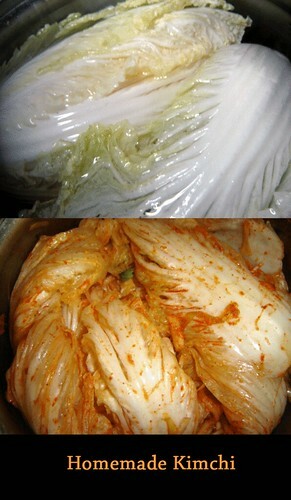 The side dish commonly consists of kimchi, pickled veggies, anchovies, or whatever they happen to make that day. These side dishes are what distinguished Korean cuisine. In a bigger restaurant, you will get around ten side dishes and you’ll feel full before the main meal even arrives. I’m also interested in Korean cooking. Mostly because of the influence from this wonderful Korean drama series “Dae Jang Geum” [Jewel in the Palace] which is about the journey of a palace girl [named Jang Geum] in the intricate world of Korean kingdom. This drama features a lot of Korean food, Korean cooking, Korean herbs, and many more. 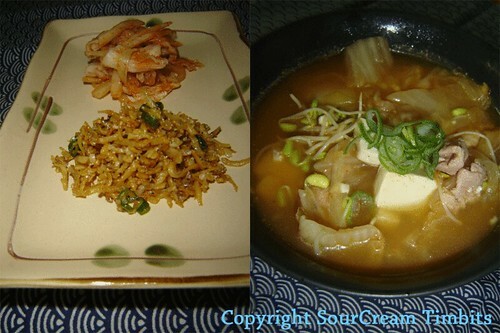 The preparation of Korean food was made really interesting that I made myself try to make some of the dishes. 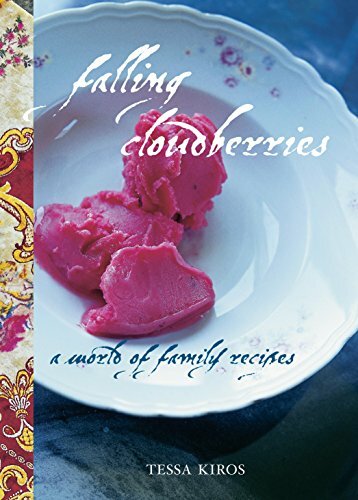 After purchasing this Korean cookbook filled with authentic recipes, I soon started planning what to make. I decided to start from the basics. Making homemade kimchi, This kimchi would have later purpose, which is to make “Kimchi Jjigae” [kimchi stew] and to be served as a side dish. One side dish is not enough, I decided to also make “Myulchi Bokeum” [fried anchovies]. Let’s see how the process evolves. Trim off the root end of the cabbage, but do not cut or separate the leaves. Put all but 1 ½ tablespoons of the salt in a large bowl and add 4 cups water. Stir to dissolve, then add cabbage, bending the end if necessary to fit the cabbage in tightly. Put a weighted plate on top to keep the cabbage under salted water, and keep at room temperature for 12 hours or longer if needed until the cabbage has softened. Drain the cabbage, rinse well under running water, and squeeze dry. Combine all other ingredients in a bowl, tossing to mix well. Stand the cabbage upright in a bowl and separate the leaves, one by one, pushing in some of the radish mixture by hand to fill. Pack the cabbage, pushing it down firmly into a covered jar just large enough to hold it [you can also use a covered pot]. Press down to remove any pockets of air, then cover the jar. Refrigerate 2 hours, then transfer jar to a warm place – around 78°F [25°C] for about 24 hours to ferment. Transfer to a fridge and chill. Chop before serving. Never use a reactive metal container to store kimchi; use porcelain or stainless steel. Plastic will permanently be stained by chili. Store kimchi in a cool, dark place – fridge is the best. 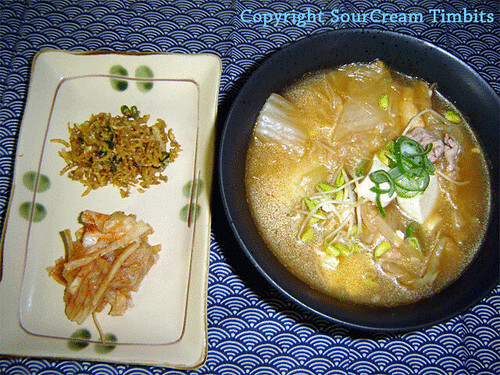 Before getting to the main course, “Kimchi Jjigae”, let’s make another side dish because it’s not common to only serve one side dish. This is called “Myulchi Bokeum” and very simple to make. In the picture, you will see that my anchovies have turned brown [from bone white] after cooking in oil. However, the picture in the book shows the anchovies as transparent white after cooked. Those are what I found when shopping at Korean supermarket. The difference is probably caused by the different anchovies used. I have no idea what type of anchovies are commonly used by Koreans. If anchovies are not purchased cleaned, discard the heads and the dark intestinal tract. Do not wash the anchovies. Heat the oil in a wok and add the anchovies. Stir-fry over medium heat until crisp and cooked, 5 minutes. Remove anchovies from wok and drain on paper towel. Clean the wok and return to the heat. 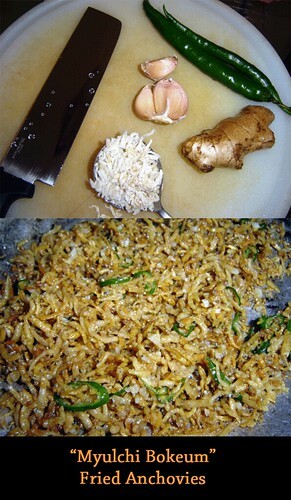 Add anchovies and sprinkle with ginger juice, garlic, sugar and stir-fry 1 minute. Add chili and sesame oil and stir-fry for a few seconds, then mix well. Transfer to a serving dish, garnish with toasted sesame seeds, and serve at room temperature. This will keep in the fridge for one week. We’ve come to the main attraction of this first entry for My Korean Kitchen. After I think about it, I’ve only heard of this dish so many times but never really tried it. I guess I was just too hooked on “Gam Ja Tang” [pork bone soup]. As I expected, this soup is hot and sour, very refreshing to the taste buds. It is recommended that you make your own beef stock [recipe follows] instead of buying the packaged ones from the grocery or using bouillon cubes. The stock really adds depth to the soup, making it a very satisfying one to eat. Heat the oil in a cast iron pot [any pot will do if you don’t have one] and stir-fry the beed until it changes color. Add the garlic and kimchi and stir-fry for a couple of minutes, then add the Beef Stock. Bring to a boil and simmer 1 minute. Add the bean curd and chili powder, return to a boil, and simmer 2 minutes. Serve into individual bowls. Sprinkle with spring onions and sliced chilies and serve hot. Hint: One cup of the beef stock can be substituted with juice drained from kimchi jar. Enjoy with a bowl of steamed short-grain rice [e.g. Nishiki brand]. Put beef in a pan with water and bring to a boil. Simmer 10 minutes, then skim off all the material that has risen to the top of the liquid. Cover the pan, lower the heat and simmer very gently for 1 ½ hours. Strain stock and use beef for some other purpose. 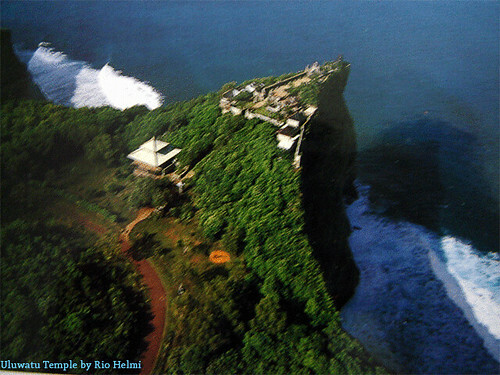 Nonetheless, it’s only a picture in a postcard that manages to capture the beautiful cliff overlooking the sea. 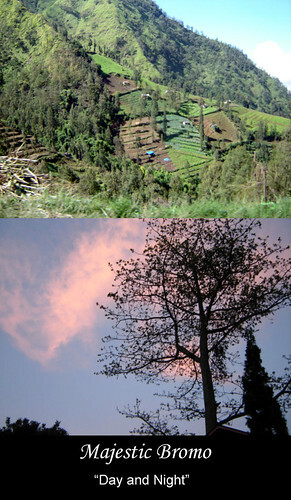 Bali is well-known for its beaches, tourists from around the world would fly to Bali to see its natural beauty. Most of the beaches are really clean with white sands and blue sea. However, the crowded ones, like Kuta, are turning into trash as too many people, local and tourists, occupy this beach. Some small businesses are also operating along the beach such as cold drink seller, surfing board rental, hairstyle [braiding] service, etc. Some other beaches, on the other hand, remain serene although that’s only what I heard. Don’t be mistaken, Bali doesn’t only attract tourists for its beaches, it also offers majestic Hindu temples [pura], hectares of green rice fields [you can even rent a bike to cycle along the “pematang sawah” [sides of the rice fields]], beautiful mountain and lake [such as Bedugul], and most importantly traditional foods that represents Bali [such as “Babi Guling” and “Ayam Betutu”]. Also, because most of this island’s population believe in Hindu [unlike the rest of other Indonesian islands], you will see a lot of dogs let loose on the streets. Mostly they are mongrels. However, if you look closely, there actually is an indigenous breed called Balinese dogs. They are prized for their long lush white fur. They resemble a white wolf, with smaller and less muscular build. Bali is accessible in many ways. People from Australia could probably go on a cruise and harbored in Bali. While people coming from other islands, such as Java [my island], can make use of the ground transportation, and then board on the ferry port at Gilimanuk. Still, it is most accessible by air transportation. You would land on an international airport called “Ngurah Rai” [after a Balinese hero]. 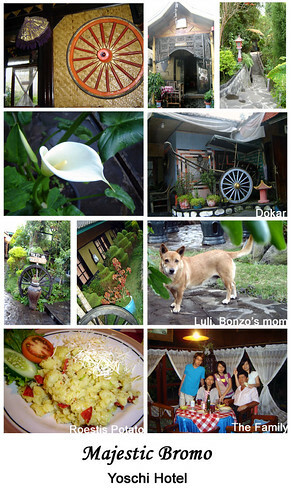 Bali is culturally rich and has a lot to offer. There are endless possibilities of what to explore in this one tiny island.